VANCOUVER, British Columbia, April 02, 2019 (GLOBE NEWSWIRE) -- Chakana Copper Corp. (TSX-V: PERU; OTCQB: CHKKF; FWB: 1ZX) (the “Company” or “Chakana”), is pleased to release additional drill results from Breccia Pipe 6 (Bx 6) at the Soledad copper-gold-silver project in central Peru. All six drill holes intersected significant mineralization, including 29.0m with 1.24 g/t Au, 0.76% Cu, and 227.7 g/t Ag from 64m in hole SDH18-103 and 14.0m with 3.83 g/t Au, 1.92% Cu, and 12.9 g/t Ag from 86m in hole SDH18-107. The initial eight drill holes in Bx 6 were previously reported (see news release dated February 7, 2019 at www.sedar.com). 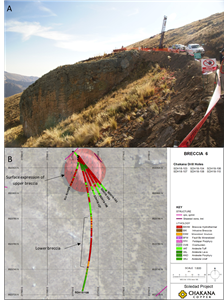 Bx 6 is located 500 metres north of Bx 5 and 1 km northwest of Bx 1 and is the northernmost and highest elevation outcropping breccia pipe identified to date in the Soledad cluster. 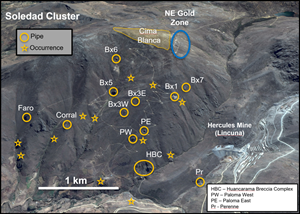 There are seventeen confirmed breccia pipes on the Soledad project, twelve of which occur in the Soledad cluster, along with twelve other distinctive targets that are consistent with alteration encountered adjacent to breccia pipes in previous drilling (Fig. 1). Four of the seventeen confirmed pipes have been drilled to date. 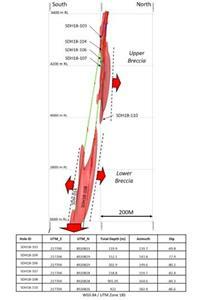 Five of the six drill holes reported here were designed to explore the uppermost 400m extent of Bx 6 (Figs. 2 and 3) within the upper breccia, while the sixth hole was designed to test a possibly separate, lower breccia body encountered in drilling by a previous company in 2016. Drill collars were located on the north central part of the breccia pipe and oriented southeast and southerly. The prospective northern margin of the pipe remains undrilled. Subsequent drilling from step out platforms will help to determine the grade and the overall geometry and plunge of the breccia. “These results are an outstanding continuation of the drilling at Bx 6, the third tourmaline breccia pipe drilled on the property to date with pervasive mineralization. These results have high silver grades while still maintaining impressive gold and copper grades. The northern margin of the upper breccia is still open and needs about 2,500m of drilling to confirm the geometry and grade distribution. Mineralization in the lower breccia is impressive in that it occurs within a zone of intense sulfide replacement of tourmaline breccia, similar to what we have seen in Bx 1. The breccia is open at depth and laterally. In places the replacement includes semi-massive sulfides dominated by chalcopyrite. Within the lower breccia mineralization over 54.0m was intersected from 718.0 to 772.0m with 0.27 g/t Au, 1.34% Cu, and 14.1 g/t Ag,” said President and CEO David Kelley. 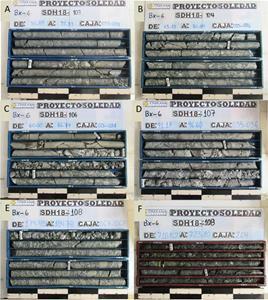 Examples of mineralized breccias from holes in this release are shown in Figures 4 and 5. Chakana has completed 25,211m of drilling to date in 94 drill holes and has a 20,000m drill program planned for 2019 that will commence upon approval of a more expansive drill permit that includes 120 drill platforms. The permit is in the final stages of review by the Ministry of Energy and Mines. Results of previous drilling and additional information concerning the Project, including a technical report prepared in accordance with National Instrument 43-101, are made available on Chakana’s SEDAR profile at www.sedar.com. A) view looking west at drill set up for Bx 6; B) map showing drill holes with geology discussed in this release. Section looking west showing the modeled breccia pipe at Bx 6 highlighting holes in this release. Light red 3D shape is based on Leapfrog model of breccia from the 6 holes in this release plus SDH-014 drilled by Casapalca. Drill hole traces show tourmaline breccia (red), andesitic tuff (green) and porphyritic andesite (blue/purple). Section includes data from 75m in front of section. Red arrows indicate open direction of tourmaline breccia. 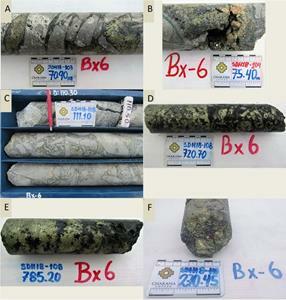 Mineralized intercepts from drill holes reported in this release showing different styles of mineralization in Bx 6: A) SDH18-103 – mixed chaotic shingle and mosaic breccia with tourmaline-sulfide matrix; the interval 87.0-92.0m assays 1.49 g/t Au, 0.91% Cu, and 439.5 g/t Ag; B) SDH18-104 –mosaic breccia with tourmaline-sulfide matrix; the interval 66.0-71.0m assays 0.80 g/t Au, 1.20% Cu, and 470.8 g/t Ag; C) SDH18-106 – contact between wallrock and mosaic breccia; the interval 62.1-67.0m assays 1.17 g/t Au, 0.63% Cu, and 467.0 g/t Ag; D) SDH18-107 – mosaic breccia with tourmaline-sulfide matrix; the interval 91.0-96.0m assays 2.62 g/t Au, 2.81% Cu, and 722.6 g/t Ag; E) SDH18-108 – shingle breccia with tourmaline-sulfide matrix; the interval 179.0-185.0m assays 4.93 g/t Au, 0.26% Cu, and 168.3 g/t Ag; F) SDH18-108 – tourmaline breccia with intense sulfide replacement; the interval 718.0-723.0m assays 0.43 g/t Au, 3.69% Cu, and 16.5 g/t Ag. Detailed core photos from drill holes discussed in this release; A) SDH18-103, 70.9m, shingle breccia with chalcopyrite-sphalerite-dominant sulfide matrix; B) SDH18-104, 75.4m, mosaic breccia with pyrite-chalcopyrite-galena-siderite matrix; C) SDH18-108, 111.1m, mosaic breccia with quartz-tourmaline-chalcopyrite-pyrite matrix; D) SDH18-108, 720.7m, tourmaline breccia with chalcopyrite-chalcocite replacement of lithic fragments; E) SDH18-108, 785.2m, tourmaline breccia with semi-massive chalcopryrite replacement; F) SDH18-110, 270.45m coarse-grained centimetre-scale chalcopyrite crystals filling matrix of tourmaline breccia.